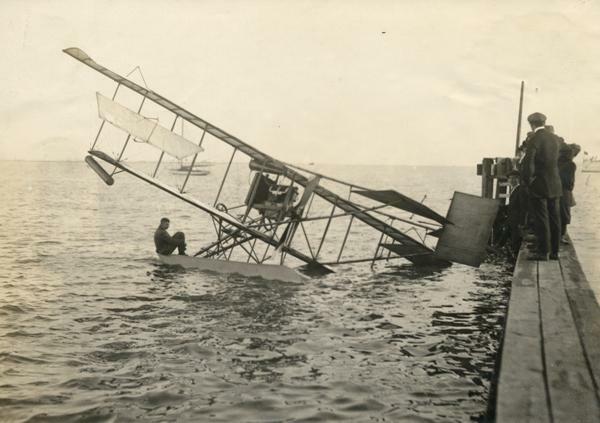 An unsuccessful test of Glenn Curtiss' hydroplane in San Diego Bay. The pilot about to be rescued is thought to be Milwaukee's John Kaminski. Curtiss made his most dramatic breakthroughs in naval aviation during the winter of 1910-1911 before John Kaminski arrived at North Island, but Kaminski was able to take part in the refinement that took place in the development of flying boats during 1912. In one incident recounted in his archival collection, Kaminski stood on the tail of the boat to provide a sufficient counterweight so that Curtiss could take off from the water.